Rumor Report: 6″ Black Series Mudtrooper for 2019? Mudtroopers, like sandtroopers, get everywhere. Hot Toys has theirs, LEGO and Funko have theirs, too and soon Hasbro will be releasing a couple in the Force Link line. But what about the 6″ Black Series? 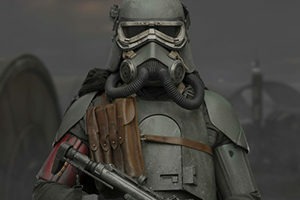 Rumor has it that there are a few more characters from Solo: A Star Wars Story coming to the front lines, one of which is a much needed mudtrooper. Details are murky, and smell like wet Wookiee, but you can probably bet on an early 2019 release from captivity.